This is my own very personal view of Aysgarth church – St Andrew’s, Aysgarth – after many years of sitting in pews, assisting with events there and just spending time contemplating the gifts that have been made to it over the years that make it a special place in Wensleydale. I often wonder what it feels like having one’s nose squashed against a stone column since 1866. 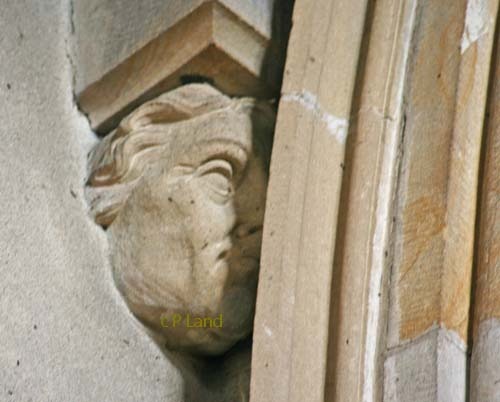 That was the year when the Victorian makeover of Aysgarth church was completed and during which someone added a series of carved heads to look down upon us. Were those stone heads bought “off the shelf” or did they have any local folks in mind? The wonderful East window bequeathed to the church in memory of William and Ann Robinson and some of their children evokes very different thoughts. I often use that window to meditate on the joy of having a personal relationship with Jesus Christ which depends so much upon the sacrifice he made on the cross. The Robinson family also gifted to the church the altar and reredos beneath the window. The latter is a magnificent piece of 19th century craftsmanship in Caen stone portraying Leonardo da Vinci’s Last Supper. Alongside there are some fascinating examples of medieval craftsmanship. 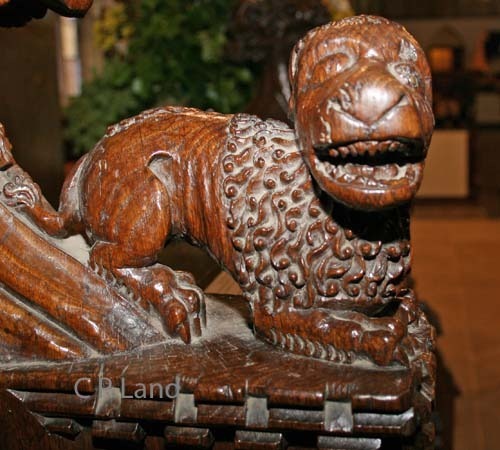 For me there is a lot of fun in the medieval carving – even if it was intended to scare people into heaven. There are those naughty little imps (or devils) peering out from the 16th century beam above the vestry door. The beam, inscribed to Abbot Adam Sedber of Jervaulx, is said to commemorate the rebuilding of St Andrew’s in 1536. The Abbot was executed in London the following year for participating in the Pilgrimage of Grace against Henry VIII – a rebellion aimed in part at saving the smaller monasteries like that at Jervaulx from dissolution. Soon after the Abbot’s death the rector and parishioners of St Andrew’s, which had very close links with Jervaulx Abbey, decided to bring the beautifully carved rood screen to Aysgarth. It is said that 20 strong men carried it on their shoulders across Witton moor to Aysgarth – the same moor where the Abbot hid when trying to evade being caught up in the Pilgrimage of Grace. At first the Jervaulx Screen served as a rood screen between the nave and the chancel at St Andrew’s. When the church was being rebuilt between 1864 and 1866 the screen was restored, painted and gilded at the expense of the church’s present patrons, Trinity College, Cambridge. The Vicar’s Stall, at the western end of the Screen, was also brought from Jervaulx Abbey. 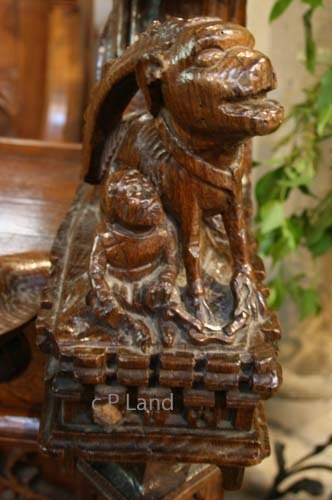 The intricate carvings on the bench ends include a little monkey beside an intriguing mystical animal and a medieval depiction of a lion. What did these mean to the Abbot when he sat in such a grand seat? Below – that lion – and the monkey with mystical animal. For me one of the highlights on a Sunday is listening to Richard Wilkinson playing the organ when the worship service is over. “It’s a wonderful instrument and it is a joy and a privilege to play it,” Richard told me. It was built by Abbot of Leeds and installed at St Andrew’s in mid 1880. 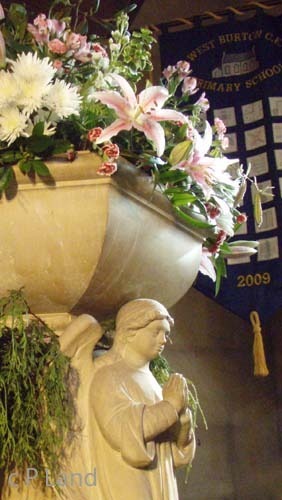 In the early 20th century there were further gifts to the church but none more soulful than the font in the baptistry. Mrs Jane Winn of West Burton had the font created in memory of three of her children who died in infancy. Baptisms are no longer held at that one as the 18th century font has been brought back into use. Mrs Winn’s husband had donated the clock in the tower to the church in 1904 and, after the 1st World War, paid for the Memorial Gates. All those from the parish who died as a result of wars since 1914 are commemorated inside the church, including Capt Philip Guy who was killed in a helicopter crash on the first day of the Iraq War in 2003. The memorials to those who died in the 18th and 19th centuries were re-installed in 1866. The Winns belonged to the gentry of Wensleydale – but another of the church benefactors of the early 20th century certainly didn’t start life in that social class. That one was born in West Witton in 1859, the illegitimate son of a house servant, Elizabeth Graham. After his birth she returned to working for Francis Sayer in Aysgarth. When her employer died her son added his father’s surname to his and became known as Frank Sayer Graham. He did eventually inherit his father’s estate and used it to build in Aysgarth a state of the art Edwardian house (Heather Cottage) which embraced the Arts and Crafts movement of the time and a fascinating Edwardian rock garden. He also developed a successful business which included exporting live grouse from Scotland to the German Kaiser and silver grey rabbit furs from the warren at Lady Hill in Wensleydale to pre-revolution Russia. The love of his life was his first wife, Mary. When she died in December 1911, aged just 45, he had a magnificent new pulpit in carved Austrian oak created for the church in her memory. 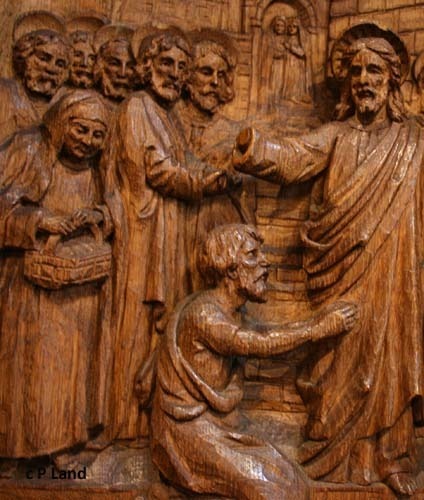 One of the panels depicts Jesus with a blind man (John 9:5). The man’s mother is shown watching her son being healed. I often wonder if Frank Sayer Graham had anything to do with her being included. Was he remembering his mother? The gifts to the church include several beautiful and evocative stain glass windows, but that is another story. If you visit St Andrew’s you can purchase both Barry Thornton’s essay and the illustrated Visitor’s Guide. And there is a copy of Marian and John Kirby’s Aysgarth Church, Odd bits of its history and Some of its people, in the local history section of the Dales Countryside Museum at Hawes. For details of services at St Andrew’s and at other churches in mid Wensleydale see Penhill Benefice.